The First Aid at Work Re-qualification is for Students who have a current Health and Safety Executive (HSE) Approved First Aid at Work Certificate or Ofqual regulated First Aid at Work Certificate and is about to expire, normally within the next six months. 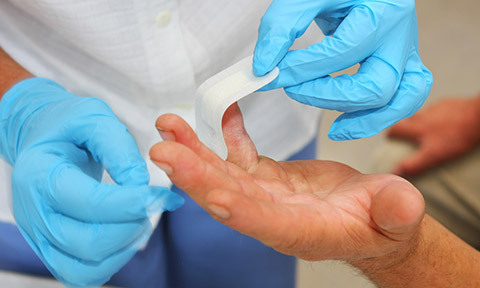 It is important that workplaces keep their First Aid qualifications up to date as when they expire the First Aider will not be able to practice as a workplace First Aider under the First Aid Regulations 1981. Suitable for any person selected by their employer wishing to act as a workplace First Aider in accordance with the Health and Safety (First Aid) Regulations 1981. Duration: Two days comprising of eighteen hours contact time with the Trainer. Level 3 First Aid At Work (QCF) Award meets the requirements of the Health and Safety (First Aid) Regulations 1981. Record Keeping: Students will learn the legal requirements of record keeping and how to complete a accident form. Priorities of First Aid: Students will understand the Danger, Response, Airway, Breathing, and Circulation approach. The Priorities of first aid to Preserve, Prevent, and promote patient recovery and how this can be achieved. This section will also detail who is in charge of a first aid incident. Unconscious Adult: Students will understand the causes of unconsciousness, what has happened to an unconscious child/infant, and how to recognize the unconscious Adult. The Student will also learn the recovery position for Adults and the rationale of the recovery position. Resuscitation: Students will understand the rationale behind Cardio Polomanary resuscitation and common causes of cardiac arrest in Aduts. Students will learn Basic Life Support for adults resuscitation according to the UK Recucitation Council guidelines. Bleeding: Students will learn how to identify six different types of external wounds. High impact wound, Incised, laceration, contusion, abrasion, and puncture and how they may occur. Students will also learn different types of blood vessels in the body and how they bleed. Students will also understand blood loss and blood volumes. Choking: Students will learn common risky foodstuffs that may cause an adult to choke. location of high risk areas of choking. Recognition and treatment of a choking adult. Diabetes: Students will be able to define diabetes, causes, different ways existing diabetes is managed. Students will also learn different types of diabetes recognition and treatment of an adult suffering from hyperglycemia and hypoglycemia. Asthma: Students will be able to identify causes of asthma, recognition of an asthma attack, triggers of an asthma attack positioning of a asthmatic and treatment options. Stroke: Students will be able to identify the cause of a stroke, recognition, and treatment options. Fainting: Students will be able to identify common causes of a faint. Physiologically the cause of a faint, positioning of a fainted adult and treatment options. Chest Injuries: Students will be able to identify three diffrent types of chest injury. Sucking chest injury, crush injury, and rib fracture. Positioning and treatment of a range of chest injuries.